Police in Florida have questioned a suspected gunman after five people were killed and eight injured in a shooting at Fort Lauderdale airport. The suspect has been identified by police as 26-year-old Esteban Santiago, an Iraq war veteran. Officials say they have not ruled out terrorism as a possible motive. US media say the man may have been mentally disturbed. He reportedly said the government was controlling his mind and made him watch jihadist videos. The attacker opened fire at the baggage claim area of Terminal 2 as passengers were collecting their luggage. Witnesses said he walked along the carousels and did not say anything as he shot people who were trying to run or hide. He surrendered to police when he ran out of ammunition, witnesses added. Why does US gun culture run so deep? The man, who was wearing a Star Wars T-shirt, had travelled from Alaska, officials said. He checked in an unloaded gun and ammunition with his luggage, and loaded the semi-automatic gun in the bathroom after landing and collecting his bag. "We are looking at all avenues. 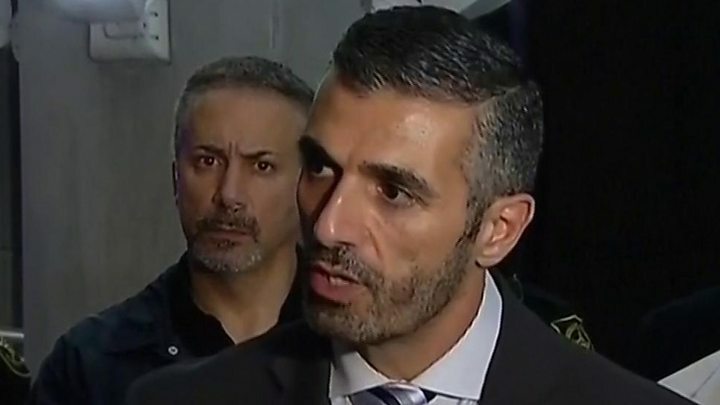 We have not ruled out terrorism and we will be pursuing every angle to try to determine the motive behind this attack," the FBI's George Piro told journalists. Sheriff Scott Israel earlier said it appeared that the suspect had acted alone. Mr Santiago is expected to face federal charges and make his first appearance in court on Monday. The suspect is a former member of the Puerto Rico and Alaska National Guard, according to the Pentagon. He served in Iraq from April 2010 to February 2011, and ended his service in August 2016. US media reported that he had received a general discharge from the Alaska National Guard for unsatisfactory performance. Mr Piro said that Mr Santiago had turned up at an FBI office in his hometown of Anchorage, Alaska, in November, behaving erratically and was turned over to local police, who took him to a medical facility for a mental evaluation. "We looked at his contacts, we did our inter-agency checks and everything and, at that point, we closed our assessment," he added, saying that Mr Santiago had "clearly" stated that he did not intend to harm anyone. An unnamed official quoted by AP news agency said that Mr Santiago told FBI agents back then that the US government was controlling his mind and making him watch videos from so-called Islamic State (IS). His brother said he had been receiving psychological treatment recently. A White House spokesman said President Barack Obama had expressed his condolences to the relatives of the victims. In a tweet, President-elect Donald Trump sent his "thoughts and prayers". Flying with firearms is legal in the US as long as the guns are kept in a locked, hard-sided container as checked baggage only, under rules of the Transport Security Administration (TSA). Ammunition is also allowed only in checked luggage. The attack was the latest in a series of mass shootings in the US in recent years, carried out by people who said they were inspired by jihadist groups, loners or mentally disturbed, who had easy access to weapons under US gun laws. Last year, in the worst shooting in recent US history, a man, apparently inspired by IS, killed 49 people at a gay nightclub in Orlando, Florida.